If you like the look of the multi-coloured lights that drape from your neighbour’s guttering, and that illuminated reindeer on their roof, then the house of the Garabedian family will really impress. On a little residential corner of the Bronx, this home shines brightly throughout December, with a display of twinkling fairy lights, religious statues and renditions of glamorous celebrities, from Rita Hayworth to Elizabeth Taylor. 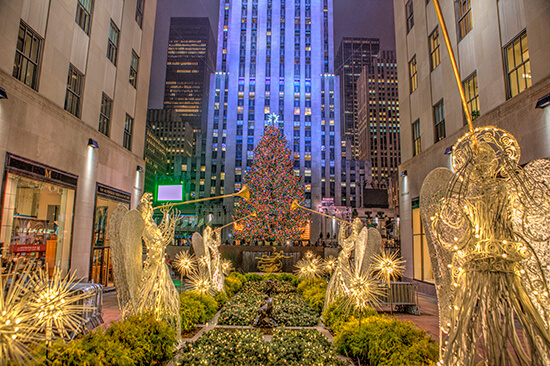 Top tip: while you’re in the NY area, there’s no better opportunity to grab a glimpse of the famous Rockefeller Christmas tree too. Grab a pair of ice skates and glide in front of this towering fir. From November to January, Disneyland Paris dazzles with holiday merriment. It boasts a Christmas parade, fireworks, festive sing-a-longs and more decorations than you can shake Rafiki’s stick at. Perfect for children and big kids alike, it’s hard not to feel thoroughly festive when surrounded by so much glitter and finery. Beijing’s shopping centres are taken over by décor at Christmastime. The one that gets the most treatment is the Solana Lifestyle Mall, which sees canopies of tinsel and light, steps glittering with blue illuminations, and trees laden with baubles as big as your head! The annual occurrence has even become a bit of a festival, with shoppers flocking from far and wide to catch a glimpse of the display in person. Our favourite is the tunnel of lights that, last year, covered a whole parade of shops. 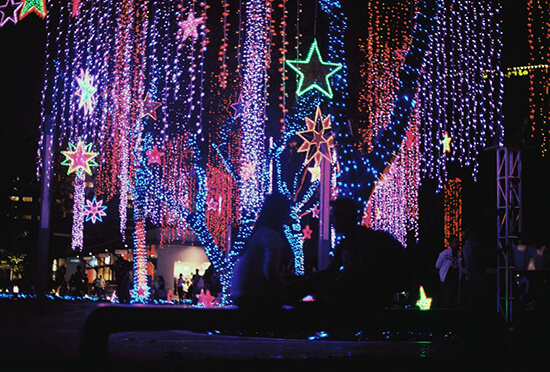 For the last six years, the Ayala Triangle Gardens has hosted its very own Festival of Lights to celebrate the yuletide season. More than a million bulbs brighten the landscape from November to January and, to kick it off, the Festival serves up a special evening display of flashing and dancing illuminations, all perfectly choreographed to Christmas music. Supported by big-name brands like HSBC, MasterCard and Coca Cola, you just know each year it’s going to offer one hell of a show. 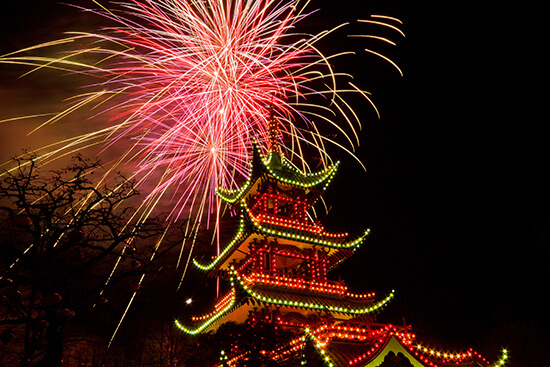 Sweets, decorations and of course, lighting, adorn Copenhagen’s famous Tivoli Gardens throughout the Christmas period. Its ‘Illuminations over the Lake’ is the big draw though; it boasts three different light shows which can be experienced multiple times throughout the wintry evenings. Visit between 25-27 December and 31 December-3 January to catch a glimpse of some fireworks too! And be sure to stop by the beating heart of Tivoli too: its Christmas market; here you can treat your loved ones, or yourself, to locally-made handicrafts. Make an appointment with one of our Travel Experts to find out how you can tie your holiday in with a festive display.